I'm spending the weekend at Legoland with the most junior of the Burger Busters, Happy Meal. He is a true Burger Buster, because he will throw a fit if there is anything but meat, cheese, and bun. Bless the lad. We pointed the car at civilization, and based upon the advise of the staff at the local Starbucks (yes, I know--I don't need anyone to point out the obvious. ), we stopped at the Karl Strauss Brewery and Restaurant. We started off with the beer braised assorted German sausages, which were fantastic, and the mustard was the best thing that I have had since my last trip to der Vaterland. We should have left on that high note. We did not. 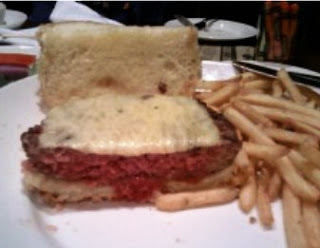 The burger came exactly as ordered--bare and Med Rare. Kudos for not screwing around--they nailed the Med Rare. The menu promised LEAN beef--I checked with the waiter, and he indicated that the burger was ground round. The burger meat was nicely aged, loosely packed, and ground just right. Also, it was like eating an oil slick. I don't know what LEAN meant to Karl, but I have to imagine that it involved grease up to the wrist--I felt like I was prepping to fist a first-timer, and I wanted to be a considerate lover. On the subject of oily messes, they made a point of slathering the bun with butter, and they did not bother toasting it. It was like Karl Strauss really had something against healthy hearts. They also didn't season the frigging thing, so it was just a giant (1/2lb), greasy, bland "up yours" aimed at the palette and arteries. Had they substituted the phrase "bland and furiously oily" for "lean" I would have no cause for complaint. Burger Review : NO! This was a brutally greasy cheeseburger.